The Town of Hyde Park publishes hearing notices and official warnings in the “News & Citizen” and unofficially on this page of our website. All meetings are held in the Community Meeting Room in the lower level of the Hyde Park Municipal Offices, 344 VT Route 15 West, Hyde Park, VT – lower level entrance from State Park & Ride. 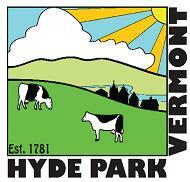 More information & agendas: 802-888-2300 or email the Town Administrator at ron@hydeparkvt.com. Regular monthly meetings: 3rd Mondays of the month at 6:00 p.m. Regular meetings: 4th Mondays of the month at 3:00 p.m. Regular meetings: 1st Tuesday of the month at 7:00 p.m. or as needed. hours of 8:00 a.m. & 4:00 p.m., Monday through Friday, or by calling 802-888-2300 x 2. Questions may also be submitted via email to ron@hydeparkvt.com. lower level of the Community Meeting Room, 344 VT15 West, unless warned otherwise. The Village Development Review Board meets as needed and agendas/minutes are posted under “Village Clerk and Trustees”. Residents of the Town of Hyde Park are required to license their dog(s) or wolf- hybrid(s) each year between January 1st and April 1st at the Hyde Park Town Clerk’s Office. Vermont law requires that your dog(s) or wolf hybrid(s) be vaccinated for rabies within the last three (3) years before it can be licensed. Animals under one (1) year of age need to have been vaccinated within the last 12 months. Proof of vaccination is required at the time of licensing. There is no licensing requirement for puppies until they are at least six months old. A penalty of 50% of the licensing fee will be applied after April 1st.